Press your uniform and polish your aviators! It is time for a morale-boosting concert Pin-Up style! Mondayitis Cabaret are gearing up for their second show of 2013. ‘Pin-Ups on Parade’. This morale-boosting concert will have you preparing to tackle the western front, solo, in sequins.Captain Spitfire is the commanding officer in charge of the this May Day concert; This dashing flyboy brings a fresh new pencil moustache to the burlesque stage. When not hunting Messerschmitts in the sky, he is victory rolling his way into ladies' hearts with his gentlemanly physique and rakish, old world charm. 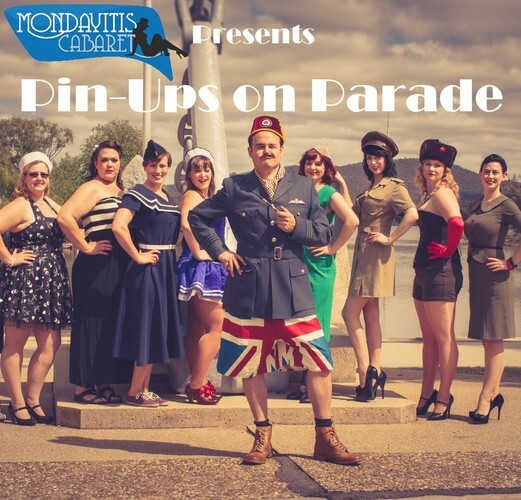 ‘Pin-Ups on Parade’ will feature a variety of local Canberra performers from professionals to nervous amateurs. This show sees amazing vocal trio The Stilettos donating two sets. This trio wow audiences wherever they go with their amazing voices and slick choreography. Local guitarist, humourist and song writer Jordan Best is also taking the stage with a guitar that may not kill fascists, but certainly gives them a bloody nose. Burlesque bombshell Deb Delicious will be tearing up the stage alongside the aptly named (for this show at least) Betty Bomber who is rolling up her sleeves with a tap dancing tribute to WW2 icon Rosie the Riveter. For something a little different strong woman Penelope Asterisk returns to the stage and this time she has help. As always Mondayitis Cabaret is raising money for the ACT Domestic Violence Crisis Service and the fantastic work they do in the region. All funds raised by ‘Pin-Ups on Parade’ go to the YPOP program; this is an early intervention therapeutic support program for children and their families who have escaped domestic violence. The funds used will go towards providing therapeutic activities for the children as well as food, transport, clothing and other means of financial assistance that will assist the families to overcome the impact of the experiences they have had living with domestic violence and help them reconnect with their community and rebuild their lives.Additional donations of art and craft supplies, children games or sporting equipment will be gratefully accepted and passed on to ACT DVCS to support the work of the YPOP program! Have a dig in your cupboards and see what you have!